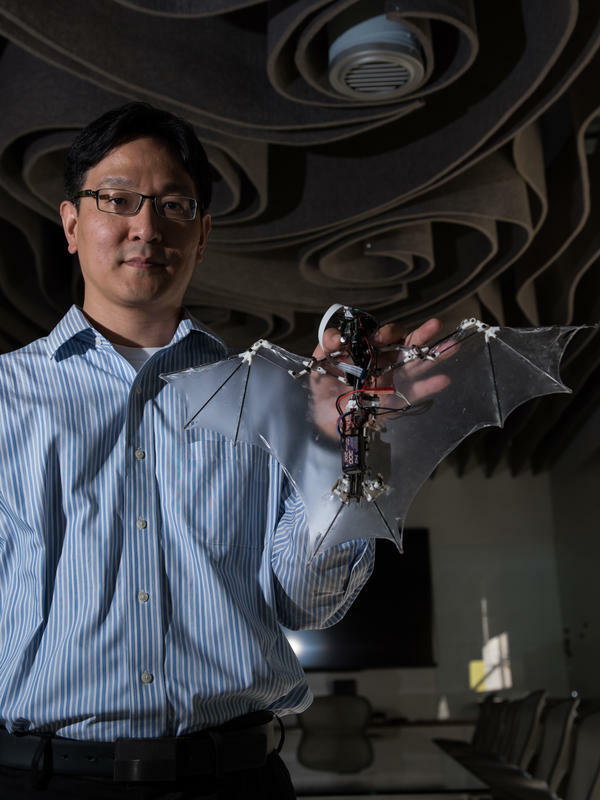 Caltech aerospace professor Soon-Jo Chung holds the 'Bat Bot' flying robot, which mimics the flight patterns of the actual animal. 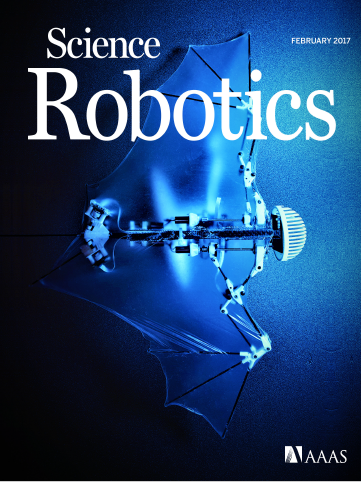 The cover of Science Robotics featuring an image of the 'Bat Bot' flying robot. "Bats use more than 40 active and passive joints, [along with] the flexible membranes of their wings," Soon-Jo Chung of Caltech told Popular Mechanics. "It's impractical, or impossible, to incorporate [all 40] of these joints in the robot's design." Or as biologist Dan Riskin of the University of Toronto put it to PBS, "bats are ridiculously stupid in terms of how complex they are." "They have a shoulder that can move in all the ways that an insect one can, but then they have an elbow, and a wrist, and five fingers and a thumb that controls part of the leading edge of the wing membrane." Chung is the lead author on a paper that made the front cover of the latest issue of the journal Science Robotics (Riskin was not part of the study) in which Chung and his team describe their design for a robotic bat that uses onboard electronics to mimic the swerving and diving of the real animal. It's name is Bat Bot, or B2 for short, and it gets away with just nine joints. "Arguably, bats have the most sophisticated powered flight mechanism among animals," the paper states. The researchers wrote that the complexity of bat wings in flight drew them to the animal as a model for flying robots. "Bats can do some absolutely amazing things: Besides being able to perch upside down (which is tricky if your initial condition is rightside up and flying), they can actually catch insects in their wings and carry them back home. The researchers mentioned both of these capabilities, saying that they're specifically working on the upside-down perching thing, but our guess is that catching insects (or anything else) in midair is probably not going to happen soon, especially if the robot is intended to keep flying after it happens. "But while B2 may not be able to replicate everything that a real bat can do (yet), it's already helping us to understand how real bats work: You'll have a lot of trouble trying to convince a real bat to fly the same path 10 times in a row to see how it moves its wings to maneuver, but a robot will quite happily do all of the experiments you could ever want." This video from Caltech shows how the team tested the robot over an enormous net. In addition to looking cool and helping us understand the secrets of flight, the team argues in its paper that bat-inspired robots could have advantages over drones powered by rotors. They have soft wings, so the potential for injury might be less, and bat bots could be quieter than whirring rigid drones.